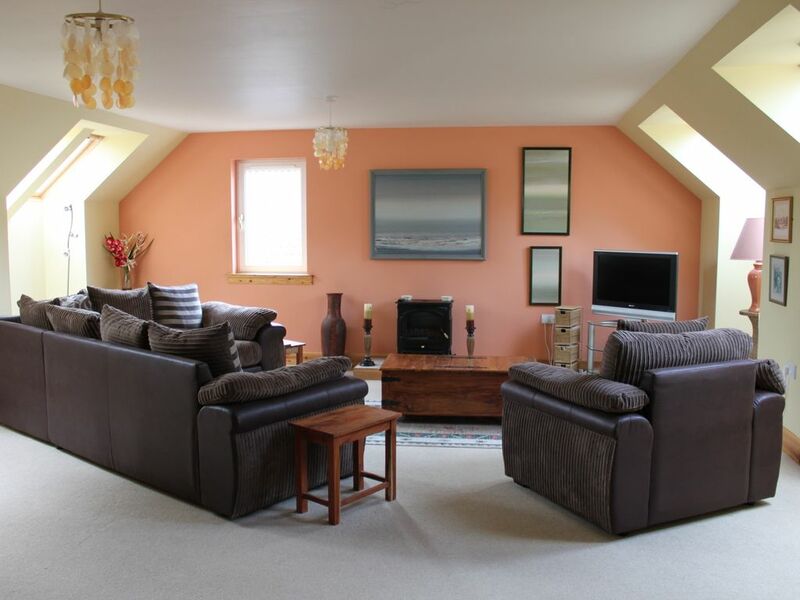 Our property is situated 2 miles from St Andrews on a quiet road in the rural countryside. It has easy access to the town by car, taxi, bus, bicycle or walking. It is a two bedroom flat above a hobbyist garage. Each room can sleep 4 people with a sofa bed in the lounge for another 2. There are two bathrooms one en suite, a fully fitted kitchen and a spacious lounge. A breakfast bar is part of the kitchen set-up with a dining table in the lounge to accommodate 6 people. Underfloor heating throughout gives it a warm cosy feeling. There are steps up to the property with one main access door. Recently we have built a beautiful Balcony on the side of the Holiday Home so guests can enjoy a morning coffee or barbeque out doors in the afternoon or evening. We have provided comfortable furniture with cushions and a Gas Barbeque. There is ample parking for a number of cars on the property. We can accommodate families or golfers of all ages, dogs are welcome as long as they are well behaved. Muir Park Holiday home is situated next to our family home so we are on hand for any advice but respect the tenants privacy. A quiet country setting not far from the thrill of St Andrews and all its amenities. Golf Attractions: St Andrews has been a magnet to tourists for decades. It's main attraction being Golf hence 'The Home of Golf' it boasts 10 Golf courses. Our property is within 2 miles of many. For those who do not play the history of the golf scene is just as fascinating, The Royal and Ancient is situated by The Old Course and next to The Golf Museum. Tom Morris' son is buried in the cathedral graveyard and can be visited. There are numerous golf shops and souvenir memorabilia. All the golf club houses are within easy access and full of information. There is a small 9 hole called the Balgove which is ideal for beginners and children no teatime needed. Next to the west sands beach there is and 18 hole putting green called the Himalayers due to its rather challenging humps! Children love it and it's a great challenge. Leisure activites: Just at the bottom of our road half a mile away is a fully equipped leisure centre with swimming pool, gym, squash courts and cafe, ideal for children as there is a children's pool and slide. For the more extravagant we have the Fairmont a mile away with a lovely spa and pool. There also many beauty treatments to be taken in the town itself. The Byre theatre is always busy and comprises of 1 main auditorium and 2 smaller ones. It produces a variety of acts and a superb pantomime. St Andrews Sea Life Centre sits on the beach, a must for the children where they can watch the seals being fed. Water sports are common and if you love surfing then with 2 beaches you are spoilt for choice. There are 3 museums which are full of local knowledge and of course the cathedral and castle are full of exciting information. The children will love the bottle dungeon and the underground tunnel in the castle. A fun packed week can be had in St Andrews. One bathroom is en suite, they are both identical. Each bathroom has a large spacious walk in shower, a sink, toilet and heated towel rail. Both bathrooms have under floor heating so are nice and cosy. St Andrews is a lovely seaside town full of local history and bursting at the seams with Golf courses. Golfers can spend all day enjoying any of the 11 courses while others less inclined to play can wander the historic street and visit the castle and cathedral ruins. There are many cafes, restaurants, pubs and gift shops to visit all very close to each other. The town boasts two scenic beaches, the West Sands featured in the 'Chariots of Fire' film, and the East sands which has won awards for it's beauty and family atmosphere. Theatre lovers can visit the Byre Theatre and for film buffs there is a Cinema. Children can make use of the local indoor swimming pool or visit the Sea Life Centre on the sea front. There are many surrounding fishing villages such as Crail, Anstruther,Pittenween and more which are visited by many every year. For the energetic walker there is a splendid coastal walk along the coast and some beautiful scenic drives. St Andrews has something for all. Golf: St Andrews boasts 11 golf courses all very close to each other. Spectacular views many overlooking the sea. The historical Royal and Ancient sits proudly next to the Old Course. You really are spoilt for choice when it comes to a high quality and standard of Golf courses. St Andrews attracts thousands of people from all over the world for it's Golf and when the big competitions are on the town is a hive of activity. For those celebrity spying, The Open is a must. The club houses are very accommodating and there are many packages to undertake if you should want to improve your Golf and have a lesson or two from a pro. If you do feel the need to play further afield there are numerous golf courses in Carnoustie and of course Gleneagles. For the keen and ambitious golfer, the tentative beginner and for children St Andrew ticks all the boxes. Ski: The closest ski resort to us is Glenshee. A weekly booking is from a Saturday to a Saturday only. Any other days are charged by the day as a daily rate which is clearly listed above. Two rate one for the weekend and one for the week. For Example if you require Monday to a Thursday you will be charge 4 weekday prices so if the price for a week day is £145 the total will be £435 for 3 nights. We try to be flexible as some people only want a short break or a weekend break.